October 19, 2012 - Hawker Beechcraft, Inc. (Hawker Beechcraft) announced that it intends to emerge from Chapter 11 protection as a standalone company. Hawker Beechcraft also announced that it is no longer pursuing a transaction with Superior Aviation Beijing Co., Ltd. (Superior) because the parties could not reach agreement on the terms of a Plan Sponsorship Agreement. Upon its emergence from Chapter 11, the company intends to rename itself Beechcraft Corporation and will implement a business plan that focuses on its turboprop, piston, special mission and trainer/attack aircraft, the company’s most profitable products and on its high margin parts, maintenance, repairs and refurbishment businesses, all of which have high growth potential. As part of this plan, the company, in consultation with its key creditor constituents, is evaluating its strategic alternatives for the Hawker product lines, which could include a sale of some or all of those product lines, or a closure of the entire jet business if no satisfactory bids are received. Hawker Beechcraft will soon file an amended Joint Plan of Reorganization (POR) with the U.S. Bankruptcy Court for the Southern District of New York. The company will also file an amended Disclosure Statement that describes the details of the proposed POR. The company intends to schedule a hearing on the adequacy of the Disclosure Statement on Nov. 15, 2012. Hawker Beechcraft’s key economic stakeholders, including holders of a significant majority of the company’s secured bank debt and unsecured bond debt, have already agreed to support the primary terms of the POR subject to Bankruptcy Court approval of the amended Disclosure Statement. Under the POR, pre-petition secured bank debt, unsecured bond debt, and general unsecured claims will be canceled and holders of such claims will receive equity in the reorganized company in the percentages negotiated by the major creditor groups at the time the company commenced its Chapter 11 proceedings. The POR contemplates that Hawker Beechcraft’s $400 million debtor-in-possession (DIP) post-petition credit facility will be repaid fully in cash. In addition, the company will enter into a new financing package that will go into effect upon its emergence from Chapter 11. The company has more than sufficient liquidity to complete its restructuring and expects to enter into an extension of its DIP post-petition credit facility, the maturity date of which would coincide with its anticipated emergence from Chapter 11 in the first quarter of 2013. Court approval of the adequacy of the Disclosure Statement will allow Hawker Beechcraft to begin solicitation of votes for confirmation of the POR. Hawker Beechcraft’s legal representative is Kirkland & Ellis LLP; its financial advisor is Perella Weinberg Partners LP; and its restructuring advisor is Alvarez & Marsal. The Ad Hoc Committee of Senior Secured Lenders’ legal representative is Wachtell Lipton Rosen & Katz. 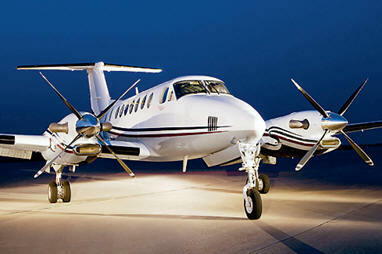 Credit Suisse serves as agent for the lenders under Hawker Beechcraft’s secured pre-petition and DIP credit facilities. Credit Suisse’ legal representative is Sidley Austin LLP and its financial advisor is Houlihan Lokey. The Unsecured Creditors Committee’s legal representative is Akin Gump Strauss Hauer & Feld LLP and its financial advisor is FTI Consulting, Inc.